There are many reports suggesting an association between vitamin D status and both the development of multiple sclerosis (MS) and its course. 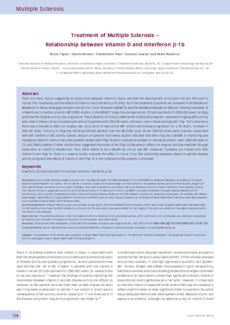 This relationship and the effects of vitamin D and interferon β-1b (IFNβ-1b) in the treatment of patients are reviewed in the BEtaferon/ Betaseron in Newly Emerging multiple sclerosis For Initial Treatment (BENEFIT) and the Betaferon/Betaseron Efficacy Yielding Outcomes of a New Dose in multiple sclerosis (BEYOND) studies. In the BENEFIT study the average serum 25-hydroxyvitamin D (25[OH]D) levels strongly predicted MS disease activity and progression. The probability of clinically definite MS (CDMS) and magnetic resonance imaging (MRI) activity was lower in these clinically isolated syndrome (CIS) patients with 25(OH)D levels ≥50 nmol/L and in those starting with IFNβ -1b. Furthermore, there was a beneficial effect on relapse rate, occurrence of new active MRI lesions and disease progression for a 50 nmol/L increase in 25(OH)D levels. Similarly, in relapsing-remitting (RR) MS patients from the BEYOND study serum 25(OH)D levels were inversely associated with MRI markers of MS activity. Genetic analysis of patients from these studies indicated that there may be a benefit in monitoring and managing vitamin D levels in early MS patients treated with IFNβ-1b and a cumulative number of risk alleles predict lower 25(OH)D levels in CIS and RRMS patients. Further studies have suggested that some of the IFNβ-1b therapeutic effects on relapse could be mediated through modulation of vitamin D metabolism. Thus, there seems to be a benefit on clinical and MRI measures if patients are treated with both vitamin D and IFNβ-1b. There is a need to further evaluate this effect in clinical trials. The relationship between vitamin D and MS disease activity along with the effects of vitamin D and IFNβ-1b in the treatment of MS patients is reviewed.